The BR-owned Cannock Chase Railway ran east from a junction north of Hednesford Station (Walsall – Rugeley line) and turned south-east to New Hayes beyond the NCB Rawnsley loco shed and workshops (1½ miles). This line was worked exclusively by NCB locos from Rawnsley. At New Hayes there was a connection with the NCB Cannock Chase Colliery Railway. South of Rawnsley the BR line reversed to run west to Wimblebury Colliery (¾ mile) to make an end-on connection with the British Waterways-owned Littleworth Tramway which enabled NCB trains from Cannock Wood and Wimblebury to reach a wharf on the Cannock Extension Canal (2½ miles from Rawnsley). The lines west of New Hayes were also used by Cannock Chase Colliery trains to serve their No.9 Colliery and a connection to the BR Norton Branch until circa 1951. Cannock Wood Colliery was reached by an NCB line which ran north-east from the Cannock Chase Railway at Rawnsley and continued beyond the colliery to rejoin it at New Hayes. This extension was disused by 1960. 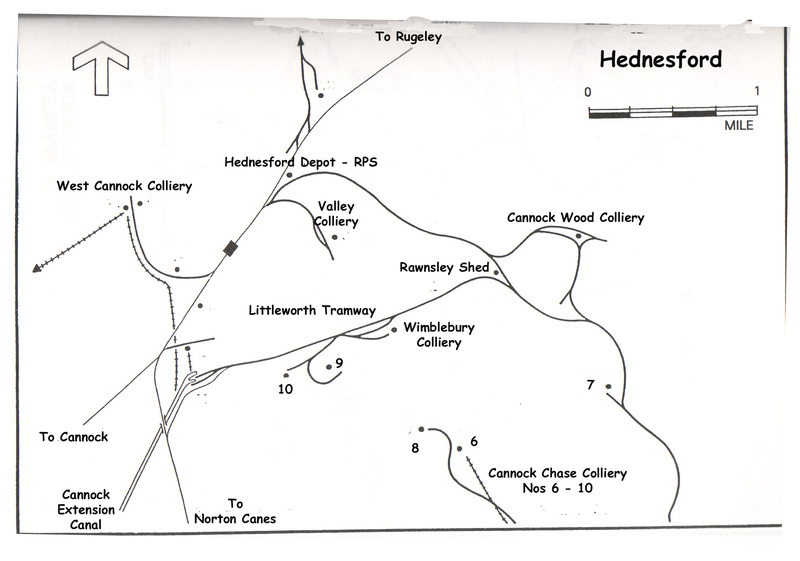 Valley, which was used only for men and materials, had an NCB line which ran south-east from the BR exchange sidings at Hednesford to the colliery (½mile). This line was closed by 1960. The traffic from Cannock Wood to the canal was carried in wooden containers mounted three to a wagon frame and brake vans were used on these trains. They ceased to run at about the same time that Wimblebury closed (12/1962) and by 1964 all lines south and west of Rawnsley had closed. A new loco shed was opened at Cannock Wood in 10/1964 and the one at Rawnsley closed 2/1965. A mineworker’s passenger service using a variety of ex main line coaches was operated between Hednesford and Cannock Wood Colliery but had ceased to operate before 1965. Some of these coaches are preserved at Chasewater Railway. The remaining part of the railway closed with Cannock Wood Colliery. As part of a major reconstruction scheme at Cannock Wood, locomotives were installed underground for manriding, minerals and material haulage, and in the new surface stockyard, from 1960 and 1959 respectively. Locomotives were not used underground at Wimblebury or Valley Collieries but during Valley’s period as a training centre, locomotives were here on two occasions for instructional purposes. We have details of some 14 locomotives which worked at the colliery at various times and we have pictures of most of them. No.1 Marquis 0-6-0ST built by the Lilleshall Company in 1867. Acquired new, still at Rawnsley in 1957, since scrapped. The picture shows Marquis taking empties to Cooper’s Lodge. No.2 Anglesey 0-6-0ST built by the Lilleshall Company in 1868. Acquired new. Worked at West Cannock Colliery 1956/57 back at Rawnsley in 1957, since scrapped. No.3 Uxbridge No picture of this one. 0-4-0ST built by the Lilleshall Company in 1868. Acquired new. Sold in July 1892. Cannock Wood The first of 3 to carry that name. No picture, I’m afraid. 0-6-0ST built by the Lilleshall Company in 1870. Acquired new, sold to Walsall Wood Colliery in 1882. No.3 Messenger Another without illustration. 0-6-0ST Manning Wardle 166/1865. Bought from Braddock & Matthews circa 1900, sold to West cannock Colliery circa 1914. No.3 Progress 0-6-0ST Peckett 786/1899. Bought from Swansea Harbour Trust circa 1915, still at Rawnsley 1962, since scrapped. No.4 Rawnsley 0-6-0ST Lilleshall Company July 1873. Rebuilt from a 2-2-2 built 1867 for the Paris Exhibition by the same company. Still at Rawnsley 1957, since scrapped. No.5 Beaudesert 0-6-0ST Fox Walker 266/1875. Acquired new. Still at Rawnsley 1957, since scrapped. No.6 Cannock Wood The second Cannock Wood. 0-6-0ST Fox Walker 318/1876. Acquired new. Sold to Holditch Mines, Chesterton, Staffs, 1927. No.6 Adjutant 0-6-0ST Manning Wardle 1913/1917. Bought from the Admiralty, Beachley Dock, Gloucesrershire, 1924. Loaned to Littleton Collieries, 1945-7. Still at Rawnsley 1957, since scrapped. No.7 Birch 2-4-0T Built at Rawnsley in 1888 but not put to work till 1890. Worked at Brereton 1949/50. Scrapped at Brereton circa 1956. No.8 Harrison 0-6-0 T Built by the Yorkshire Engine Company, 186/1872 as a 2-4-0 T, rebuilt to 0-6-0T 1916. Bought from B.P.Blockley of Bloxwich in 1905. It had originally been Potteries, Shrewsbury and North Wales Railway ‘Hope’ and later No.1 on the East and West Junction Railway. Sold to Stanton Ironworks, Stanton, Notts., 1950. Since scrapped. No.9 Cannock Wood (The third and best-known ‘Cannock Wood’) 0-6-0T Built by the London, Brighton & South Coast Railway at Brighton in 1877 (LBSCR 110). Bought from the Southern Railway (SR 110) in 1927. Still working at Rawnsley in 1957, continued to work for the NCB into the mid 1960s then preserved by the Railway Preservation Society, originally at Hednesford and later at Chasewater. Subsequently sold to members of the East Somerset Railway at Cranmore. Has been in steam since but is now undergoing an overhaul. The final loco was a Fox Walker 0-6-0ST 370/1878 which worked for the New Cannock & Wimblebury Colliery Co., which went into liquidation in 1887. Plant and loco were offered for sale July 1887, and circa 1889 the mine was reopened by the Cannock & Rugeley Colliery Co. which then provided its own locos to handle the traffic. The loco was either sold or scrapped soon after. I have a photograph of Engine no 11, with my Great Great Grandfather stood next to it. I would like some information if you have it; would be glad to email a copy of the picture. It is photographed either at Hednesford or Cannock. You’ve certainly got me guessing here – I have no record of a locomotive No.11 at Cannock & Rugeley Colliery, or anywhere else in the Cannock Chase Coalfield. However, I have a few friends who know just about every engine in the country and where they were used so if you could send me a copy of the photograph that would be great. I do like to test them sometimes!! Thanks for this. can you send me an email address as the one you used is a ‘no reply’ address? I can send a picture with my Great Great Grandfather, Thomas LONGSTAFF, stood next to the engine. I am guessing it says Cannock and Rugeley but may be wrong. It is definitely a picture taken in Cannock/ Hednesford area, but can’t quite read the plate on the side. I’d be VERY grateful for any information on the engine. I live in the huse in hednesford that Thomas Longstaff built. I have a picture of him outside the house. would be nice too trade pictures as i am very interested in the history of the house i live in. Thank you very much for your comments, very much appreciated. John. Hi there, Looking at these photos brings back many happy memories. I was born and raised in Hednesford ( I now live in Toronto), both my father and uncle and their father worked for CRC. In the late forties early fifties during the summer holidays my father used to take me to The Wimblebury signal-box, my father worked at the colliery. The signal man Reg Rollins? used to let me stay there, I occasionally got to ride on one of the engines when they were performing shunting duties, big thrill for a seven or eight year-old. Glad to see that No. 9. “Cannock Wood” has been preserved, looks like I need to take a trip to Somerset. Finally, thanks for posting these wonderful photos, keep up the good work. I’m glad you enjoy the blog. My background is not far off the same as yours but a slightly different area. My grandfather and his brothers worked at Jerome’s and the Fair Lady at Norton and Heath Hayes respectively. I have not travelled as far as you – the best I can manage is from Brownhills to Hednesford! I help in the museum at Chasewater Railway and now have 50 years worth of magazines to wade through and blog – could take quite a while. Hope you continue to pop into the blog from time to time. Many thanks for taking the time to send your comment. Well remembered – the Fair Lady was indeed the Coppice Colliery. I would be delighted to meet you if you do get over here – by that time it will probably be Chasepuddle, they’re draining the reservoir at the moment to do repairs to the dam. There is a link to the Chasewater Dam News on the blogroll. And yes, I’d love copies of your photos please, always interested in old locos, especially industrials. Due to a post on modelrailforum about colliery locos I came across your blog. I have a watercolour or coloured pencil sketch of “Marquis” No 1. This is dated and signed ” A.Sanders 1915″ and shows a side view of marquis but the scale is not quite right and the wheels appear to be too small. Do you know of any other drawings like this ? This has been in the family as long as I can remember. My family has connections with the C&RCR as my grandfather was a colliery engineer and worked in the area – his house is named “Rawnsley” but is near Pooley Hall colliery where he ended up as Chief engineer in the 30s and 40s. Good aftenoon all, may sound like a bizzare request, but i am trying to find any pictures of ‘The Crossings House’ that stood at where the old Cannoc Wood Colliery crossed Cannock Wood Street to the Rawnsley Sheds. I am after pictures from circa 1950 or so to show the house and the crossing if anyone has any. Thanks for the interest. I was aware of a diesel shunter as I have some interest in the East Cannock pit. I live just off Stafford Lane! I’ll send a couple of photos in case you haven’t seen them, taken from the book about the pit by Alan Dean, Chairman of the Cannock Chase Mining Historical Society. My great, great, grandfather Edwin Carter drove the Messenger circa 1900. His sons worked in the workshops. His grandson Edwin Tilsley was ill and unable to do manual work. He drew the engines in the workshop and he may have drawn some of the drawings of engines mentioned in your blog. He died aged 23 in 1917. I started work at Pooley Hall in Warkshire as an elect., apprentice before moving to Lea Hall about 1960.When I went to Cannock Collage I can remember going over the level crossing just passed the Slade pub and if I timed it right I would , have to wait for the steamer to cross from Cannock wood, enjoyed that until one day a diesel came down never saw the steamer again .Don’t know which steamer it was. Re: No.3 Progress, Peckett 786/1899. The name plate was transferred to RSH no. 7298 of 1946. This was by a colliery manager. It may be that the RSH loco originally had the same name as the manager of the colliery it was allocated to. The locomotive went to Cadley Hill along with the manager. The locomotive was active into the early 1980s & is on the Tanfield Railway now. At least the plates are on a working locomotive, or are kept safely after being copied. You know what it is like with metal thieves these days.